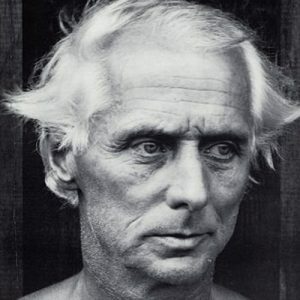 Max Ernst was one of the most influential artists of the 20th century. He was affiliated with Dada, with Surrealism, and was one of the progenitors of Abstract Expressionism. Ernst was an artist of relentless invention and imagination, whose ideas and techniques continue to hold great sway today. Works by Ernst feature in most of the great museums of modern art throughout the world. Ernst was born in Brühl in Germany in 1891. As a student in the early 1910s, Ernst became increasingly involved with the pioneers of German Expressionism, not least through his friend August Macke, and found himself encountering luminaries from the international avant garde, including Guillaume Apollinaire. He also met a fellow student at the University of Bonn, Luise Straus, whom he would marry in 1918 and who became a prominent art critic. The couple would have a son, Hans-Ulrich, who became better known by the name ‘Jimmy Ernst’ as one of the Abstract Expressionists. At the outbreak of the First World War, Ernst was conscripted into the German army, serving on both fronts. Following the Armistice, he returned to art, creating collages that encapsulated his disregard for the rationality and authoritarianism that had fuelled so much of the conflict. He became involved with Dada, in part through his old friend Hans (Jean) Arp. Together, they worked to establish Dada in Cologne while also staying in contact with a wider international network of writers and artists. This led to increased contact between the nascent Parisian Dada group, and resulted in Ernst’s meeting the poet Paul Eluard and his wife Gala. Ernst eventually began an affair with Gala that resolved itself for some time into a ménage-à-trois. With the Eluards, Ernst moved to Paris, where he was present at the beginnings of the Surrealist movement pioneered by André Breton. The three lovers moved to the Parisian suburb of Eaubonne, occupying a home that Ernst would decorate with fantastical murals; when published, they influenced the early Surrealist works of René Magritte. Ernst’s insatiable appetite for innovation led him to become one of the most prominent of the Surrealists, developing techniques that allowed him to tap into his subconscious. Ernst developed frottage, rubbing a picture surface against another material, for instance wood, in order to achieve a pattern which he would then use as a springboard for his imagination. The resulting shapes would suggest the various forms, creatures and characters that emerged, including the presence of Loplop, the bird avatar that featured in a number of his pictures. Ernst also continued to use collage, publishing entire books using the technique, in which absurd new configurations of old line engravings were created, for instance La femme 100 têtes of 1929. Later, he would become the most important proponent of decalcomania, the technique developed by Oscar Domínguez of pressing ink or paint against a hard surface to create billowing, organic forms. These are exemplified to dramatic effect in Swampangel of 1940, now in the Beyeler Foundation, Riehen, and Europe after the Rain of 1940-42, from the Wadsworth Atheneum Museum of Art, Hartford, Connecticut. Ernst married a Frenchwoman, Marie-Berthe Aurenche, and subsequently lived with the artist Leonora Carrington. He became a friend of a vast array of the most prominent artists of Surrealism, as well as other figures of the day. Many of these would be enduring friendships. Some were also vital to his survival. When the Second World War broke out, Ernst found himself in an impossible situation: his art was considered degenerate in his native Germany, and he was interned in France, originally as an enemy alien. After his release, France fell and Ernst found himself on the run—he was aided to reach the United States by a number of friends, family and supporters, including the socialite and art dealer Peggy Guggenheim, to whom he was briefly married. Reaching New York, Ernst became a beacon for the avant garde: his anti-traditional techniques and focus on the importance of automatism chimed with the developments that were taking place there. The fact that his son, Jimmy, was already established with the artists known as the Irascibles added an additional channel of communication. Ernst met and married another artist, Dorothea Tanning, and the pair moved to Sedona, Arizona. While attracting attention to the arts and crafts of the local Hopi tribe, Ernst also continued to create works in a variety of media, not least sculpture. His home became a form of ever-shifting work of art. Similar transformations would take place in his subsequent houses in France as well. During the second half of the 20th century, Ernst was able to maintain a formidable momentum in his artistic output, constantly innovating. He received increasing acclaim with retrospectives and shows in a number of countries during these decades, as well as a panoply of civic honours. He was a key figure for generations of artists in Germany, France and the United States alike, and his influence, both direct and indirect, is still felt to this day.